Sustainability | prairie architects inc.
Prairie Architects Inc. recognizes that architecture has a direct impact on the environment. Buildings are responsible for an enormous amount of global energy use and according to the 2018 Global Status Report, building construction and operations accounted for 36% of global final energy use and 40% of energy-related carbon dioxide (CO2) emissions in 2017. Our team understands that a building is a living, breathing system of parts that is one piece of a greater ecosystem. Prairie Architects has a long standing history of innovation with a sustainable approach to design dating back to 1976 when we were awarded our first national sustainable design award for the Roseau Children’s Centre, which was constructed from recycled materials, included a sod roof and earth berm exterior, and contained composting toilets, solar panels and a radiant floor heated by the central wood burning stone fireplace. Over the years the firm has continued to build upon the principles of sustainability, but with an increasing contemporary design focus and view to life-cycle costing, durability, climate change and resilience. Today, Prairie Architects Inc. is on the forefront of sustainable design with a remarkable track record in a sustainable approach to building. We offer a range of Sustainable building services including Integrated Design, Sustainable Building Project Management, LEED Coordination and Daylight Modelling. Understanding the enormous impact that buildings have on the environment and climate change has led Prairie Architects Inc. to work within a sustainable framework for design and construction. LEED®—an acronym for Leadership in Energy and Environmental Design™— is the pre-eminent program for the design, construction, maintenance and operation of high-performance green buildings. LEED is a green building rating system that we use to evaluate the environmental performance of the whole building perspective over a building’s life cycle. It is a performance-oriented rating system where sustainable strategies are implemented that are relevant and important to a specific project and a building’s operation. LEED is a third party certification system developed first by the US Green Building Council (USGBC) and adapted by the Canada Green Building Council (CaGBC) for the Canadian landscape. Prairie Architects Inc. was the first architectural firm in Manitoba to have a LEED® Accredited Professional and continues to have a majority of staff with this credential, including principal architects, senior project managers, dedicated sustainable building coordinators and daylight simulators. Our commitment to training staff as sustainable experts has resulted in an impressive certification success rate, currently at 25 projects, including 3 LEED® Platinum, 9 LEED® Gold, 7 LEED® Silver and 6 LEED® Certified projects. Prairie Architects Inc. was the first firm in Manitoba to certify a building using the LEED rating system, with the award-winning adaptive re-use project for Mountain Equipment Co-op. Integrated design is a forum that effectively engenders teamwork, quality control, and demands bold solutions to sustainable buildings. We do this by implementing a consensus based Integrated Design Process (IDP) involving the client and user groups, consultants, and construction managers, among others. This group forms the core project team who work together, beginning early in the project, making integrated and collective decisions on the nature of the project. This process engages all project team members in an informed cross communication and active decision making process, which enriches innovation, sustainability, as well as budget management through to the successful completion of the project. We use the IDP as a methodology to provide an interdisciplinary, interactive and organic forum to design sustainable building forms, ensuring a framework for open discussion and decision-making, thereby reducing misunderstandings, conflicting directions and missed opportunities. Integrated Design provides a high quality design and construction process, saves operational costs and maximizes synergies among systems, allows the ability to select the most compatible sub-consultants, and coordinates engineering disciplines early in the process. ~ Sustainable Building Coordination, providing guidance for design and owner teams through sustainable certification. Prairie Architects Inc. facilitates the Integrated Design Process and sustainable project management. This service includes an assessment of appropriate rating systems and target levels for LEED, WELL, Living Building Challenge, Passive House or other provincial green building and incentive programs. We work with clients to determine the most applicable and relevant sustainability goals and achieve certification. ~ LEED Certification, which includes determining the most suitable rating system (i.e. LEED V4.1, LEED-CI, LEED-EBOM), and thorough integration of the LEED process with owners, design teams and contractors from beginning of project to final certification. This includes an in-depth consultation with owners to determine most cost effective and meaningful path to certification. We work with our clients to determine the most appropriate sustainable building initiatives. ~ Our Sustainable Building coordination will educate clients, design teams and contractors on the benefits of sustainable building certification. ~ We offer review of projects in progress or completed to assess if certification is possible. Building simulation tools are used to evaluate designs for energy efficiency. Our team integrates energy simulation analysis into our design process. 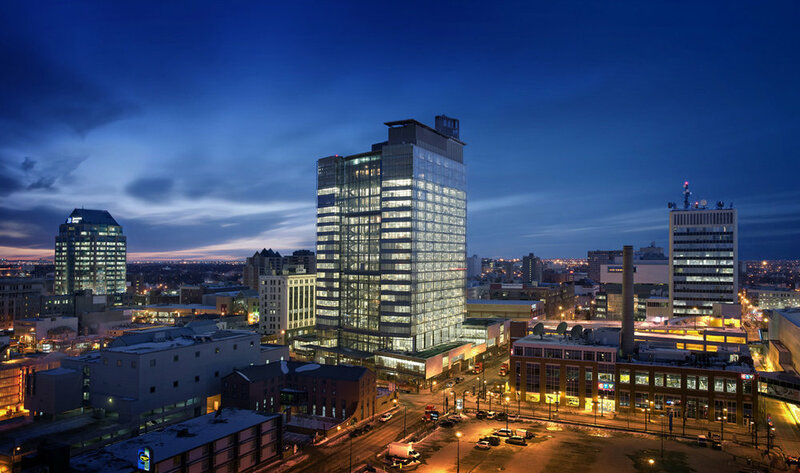 These efforts have resulted in a number of remarkably efficient buildings, that have lower upfront energy demand resulting in long-term operating savings. 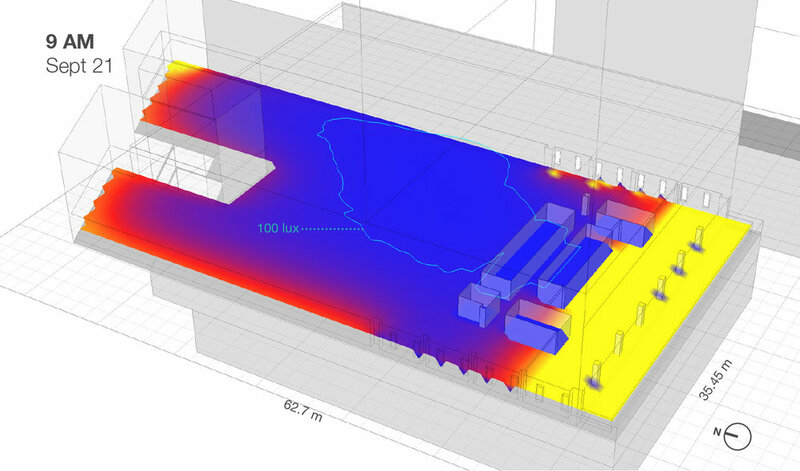 Energy simulation is most effectively used as part of an Integrated Design Process. Dedicated energy modellers join the team early in the process and provide input throughout the design, which maximizes the environmental and economic benefits for the project. Studies have shown the benefits to health, well-being and productivity when significant amounts of natural daylight and views to the outdoors are provided to building occupants. By providing ample natural daylight, and reducing the reliance on artificial lighting with occupancy and daylight sensors on light fixtures, a significant reduction in energy and operating cost can be achieved. Prairie Architects Inc. uses daylight simulations to guide design decisions with the goal of optimizing daylight while considering heat gain, glare and layout constraints. Daylighting simulation allows our team to evaluate building orientation, window area and placement, as well as various glazing properties and shading strategies. With the information we gather, we are able to reduce glare, set goals for reduced lighting power density, and control passive solar gains. A daylight model provides feedback to designers in the Integrated Design Process to enhance the quality of spaces for building occupants.